Most people don’t think about mulch too much, but mulch can do wonders for your garden and front yard. 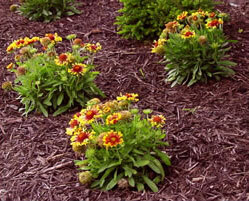 There’s a variety of mulch and the different types of mulch should be used for specific garden settings. Mulch is especially crucial if you have a vegetable garden or are planning to create one. Below are several benefits of mulch, highlighting the positives of the not-so-talked-about garden asset. Mulch is a great defender. It helps plants maintain their moisture, but only if there’s the right amount of mulch added because the plants will rot if there’s too much mulch. Mulch can also protect plants and vegetables from the harmful effects of the sun because it keeps the water in the soil and slows the evaporation process. Mulch can add nutrients back into the soil, helping the growth of vegetables. Mulch will act as a barrier between the plants and the ground, reducing the risk of health dangers. Straw mulch is great because it’s light weight. This light weight keeps plants from rotting at the base. As you are applying mulch in your garden, be sure to cover the soil so you’re unable to see any of it below. A coating of about 2-4 inches is good enough. If you’re using light mulch, use a thicker layer, and the opposite goes for heavier mulch. Mulch helps gardens in general by keeping the plants and vegetables healthy and will help your garden grow strong.